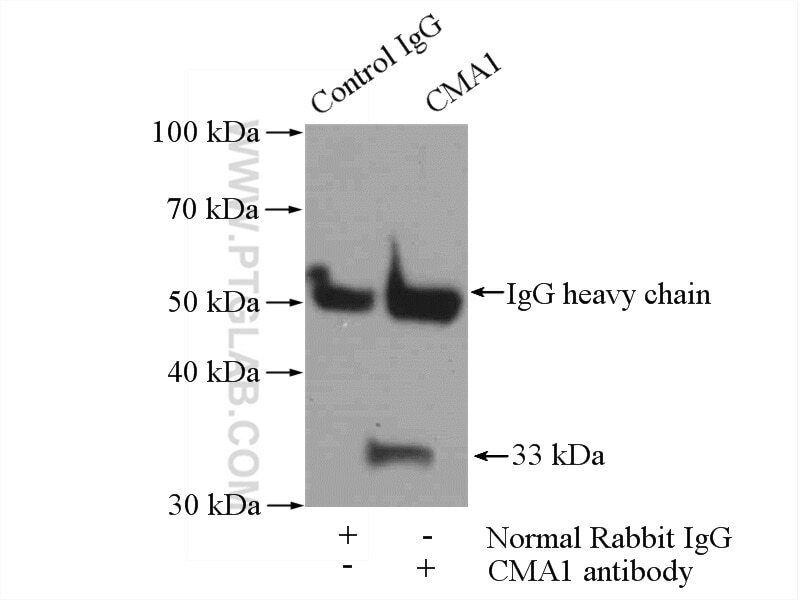 IP Result of anti-Mast Cell Chymase (IP:18189-1-AP, 4ug; Detection:18189-1-AP 1:300) with mouse heart tissue lysate 2400ug. Mast Cell Chymase, also named as CYH, CYM and CMA1, belongs to the peptidase S1 family and Granzyme subfamily. It is the major secreted protease of mast cells with suspected roles in vasoactive peptide generation, extracellular matrix degradation, and regulation of gland secretion. CMA1 maybe a target for cardiovascular disease therapies. The circadian clock is functional in eosinophils and mast cells. Expression of Recombinant Human Mast Cell Chymase with Asn-linked Glycans in Glycoengineered Pichia pastoris. Overexpression of monocarboxylate anion transporter 1 and 4 in T24-induced cancer-associated fibroblasts regulates the progression of bladder cancer cells in a 3D microfluidic device. Chymase-producing cells of the innate immune system are required for decidual vascular remodeling and fetal growth.